As your team works together you'll undoubtedly have files that you'll want to share and collaborate on. Microsoft Teams makes it easy to share files within channels. If the files are Word, Excel. PowerPoint or Visio files your colleagues can even view, edit, and collaborate on the files right within Teams (editing in Visio Online requires a license). For Word, Excel, and PowerPoint, they can see each others changes in almost real time Let's take a look at how you can use Microsoft Teams to work better together. Note: Viewing non-Office files in Teams must be done from the underlying SharePoint library. Within each Microsoft Team there are one, or more, channels where more focused discussions take place. Each channel has its own file folder where you can share files with that channel. To access that folder go to the channel and click Files on the tabs above the conversation window. Note: Make sure to use the Files tab at the top of the channel conversation window instead of the Files button on the left-hand navigation pane. The Files button on the navigation pane gives you access to ALL of your cloud files, rather than just the files for that specific channel. In the library you can upload existing files or create new ones. There are two primary ways to upload existing files into your library. Both methods start by going to the files folder for your channel and both methods, by default, upload copies of your files to the channel file folder. Drag and drop - Using your mouse, drag the file from where it's currently located and drop it on the Teams window among the files. You can also easily upload multiple files using this technique. Upload - If you click the Upload button, a File Explorer dialog box will open, allowing you to select the file (or files) you'd like to upload. Select those files and click Open. Any files you upload will be accessible by any member of your Team. To quickly create a new Word, PowerPoint, or Excel document in your files folder click the New button and then select the kind of file you'd like to create. Give your new file a name and click create. The new file will open in Teams so you can begin editing it, and if you'd prefer to work in the desktop version of the app you'll find an Open in... button on the ribbon that will open the file there for you. As soon as it's created your new file will be available for your team members to edit as well. Files stored in your team's file library are accessible to every member of the Team. In Office Online, Office for Android or iOS, or the latest applications from Office 365, you and your Team members can collaboratively co-edit Word, PowerPoint, or Excel documents, or comment on Visio files. No need to check files out or worry about if one of your colleagues has the document open. Just open the file you need to edit and if other Team members are editing it too your changes will be seamlessly merged as you work. There may be an occasion when you'll want to share your file with somebody outside your team. If the file is a Word, Excel, PowerPoint or Visio file the easiest way to do that is to open the file with the appropriate Office Online or Desktop app and click Share towards the top right corner of the window. That will open the Share dialog box where you can enter the aliases or email addresses of people you want to share with. 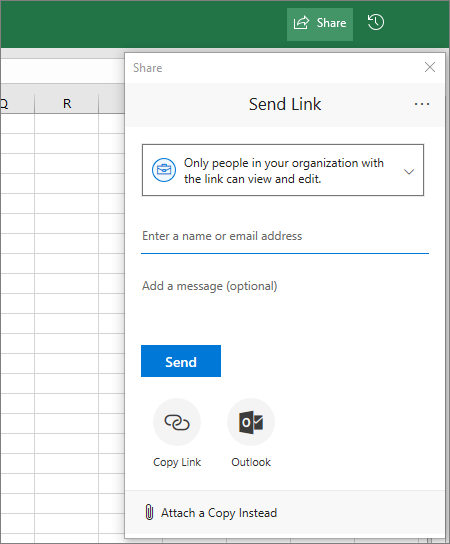 Important: To share with somebody outside your team you'll have to open the file in Office Online or Office desktop; the Teams editor doesn't have that feature. Click the arrow next to the Edit button and choose the appropriate app. If you want to share with people outside your organization you may have to click the permissions drop-down (right above where you add the people you want to share with) and select that Specific People can access the file. Once you've shared the file, those users can edit the file in real time (unless you unchecked Allow editing in the Link Settings dialog) just like the other members of your Team can.